AMD wants to tout the Radeon VII’s content creation chops, too. So for this review, my colleague Gordon Mah Ung ran additional tests focused on this use case. For content creation, we used a machine a little better suited to actual content creation artists: AMD’s 32-core Threadripper 2990WX CPU in an MSI X399 MEG Creation motherboard. The build used Windows 10 RS5 and 32GB of DDR4/3200 in quad-channel configuration. The OS was installed on a HyperX SATA SSD with a Plextor M8Pe SSD for workloads that might be disk-bound. We used the latest available drivers for the Radeon VII and the GeForce RTX 2080 Founders Edition card. OpenCL was used for the Radeon VII, while the GeForce ran on CUDA. 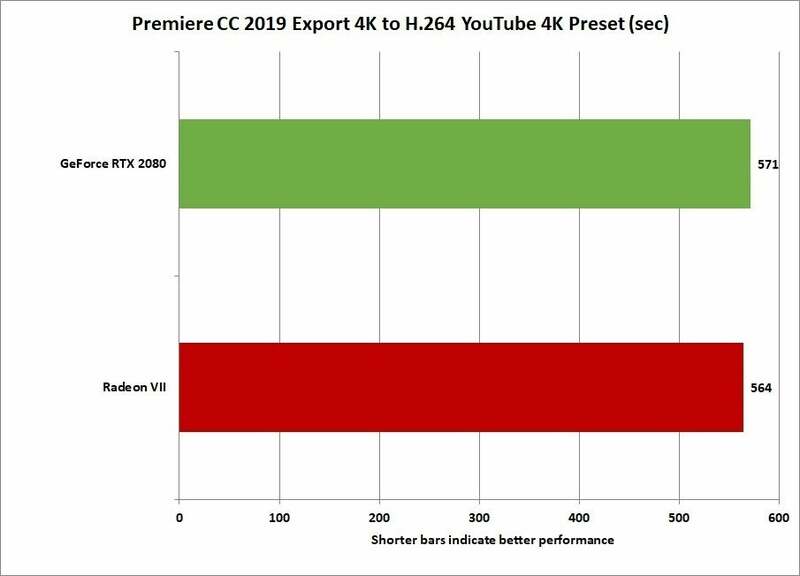 Our first test uses Adobe Premiere Creative Cloud 2019 to export a 4K video using the the H.264 YouTube 4K preset and the max render quality option. The first portion of the video is mostly a straight encode, while the latter half layers on GPU-taxing graphics and B-roll. The entire clip is also color corrected. The results gave the Radeon VII a very small lead, but let’s call it a tie. For the most part, these results match performance data from AMD for 4K content where the two cards are nearly even. We should note that AMD says using 8K resolution video actually opens the gap more. Using Adobe Premiere CC 2019 to export a 4K resolution file with color correction and graphics overlays. Our next test used the Chaos Group’s V-ray benchmark to measure performance when rendering a ray-traced scene on the GPU. The Radeon again has a small lead of about five percent. The elephant in the room. however, are those two words: ray traced. While the current V-ray benchmark does not support Microsoft’s DirectX Ray and by extension, Nvidia’s RTX, it will. And once that happens, you can expect the performance win to shift in a big way to Nvidia. 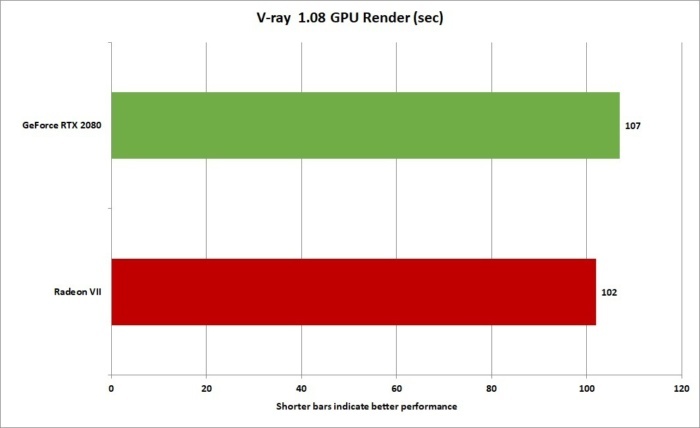 The Chronos Group’s V-Ray GPU test measures performance of a GPU when used for rendering ray traced images. The Radeon VII has a slight edge over the GeForce RTX 2080 here. One could argue, however, that straight up OpenCL performance matters more in the here and now. 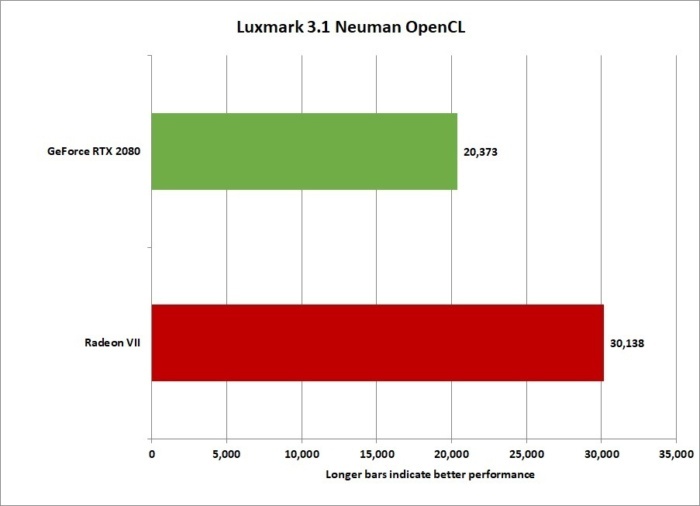 To measure OpenCL performance we used LuxMark 3.1 (available here) to gauge performance of both the Radeon VII and the GeForce RTX 2080. The winner: Radeon VII in a big way. LuxMark (based on LuxRender) gave the Radeon VII everything from as little as 10 percent to 38 percent advantage over the GeForce RTX 2080. One area where the Radeon VII flexes its muscles is in LuxMark’s OpenCL test. We found the Radeon VII outperformed the GeForce RTX 2080 from 11 percent to 38 percent in the three available workloads.